We aim to develop new products, eliminate unprofitable products and improve existing products to give better satisfaction to customers. 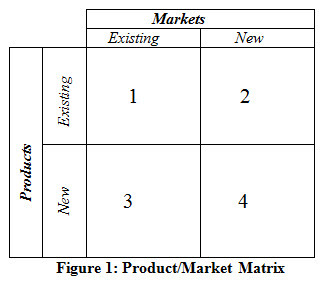 One framework that aids this process is Ansoff's product/market matrix (Figure 1). This enables companies to assess their market situation and decide on a future strategy for products. Handling resistance to change can be assisted by use of Lewin’s 'Force Field' analysis (1951). Lewin's model identifies a series of 'driving forces' (i.e. forces for change) and a series of 'restraining forces' (i.e. forces against change). Amongst the list of drivers relevant to the company I am analysing, new personnel, changing markets and increased competition all apply. Restraining forces against this change include loss of status, fear of the unknown, strength of culture (strong traditions, long-serving employees), rigidity of structure and strongly held beliefs. For change to be successful, driving forces and restraining forces must be balanced. The first stage is for restraining forces to be removed. To address such issues in this company, I would suggest communication is critical. The benefits of and reasons for change should be clearly explained. More specifically the crucial role of the production manager should be explained and his involvement should be sought. However, such is the strength of the company’s culture and tradition, it may take considerable time to overcome deep scepticism. The current functional structure has caused individuals and departments to become too focused on their own goals and activities. I suggest the adoption of a different organisational structure to help address this issue. A product-based structure has the advantage of increasing responsibility and accountability so that should problems occur in the future they can be tackled directly, rather than departments aimlessly blaming each other. Ultimately this also removes the inter-departmental rivalry currently evident, and ensures all departments play a more active role in achieving the goals of the organisation. In a product-based structure "markets, not processes, get the employees' undivided attention" (Mintzberg, 1979: 127). A product-based structure also adds greater flexibility and permits a faster response to change. Distribution channels need to be established to achieve market share and product sales. The greater the number of customers reached, the greater the chance the product ends up on the approved product list or preferred vendor lists of other businesses. The more end-users use the product, the greater general awareness of the product there will be, and hence the more likely employees will be to choose it from those lists. The market strategy needs to exploit the awards the company has won for its products and the recognition it has achieved. The website should be updated, and should offer the option for online purchasing. To attract the right kind of people to the website there needs to be more advertising on other websites that have healthcare content. Although I think advertising in magazines is a good idea, I don't think the cost is really justified. When the company is bigger, magazine advertising can be part of an ongoing advertising campaign. I would suggest the following plan of action. In the short term, concerning change implementation, I recommend adoption of a steering committee and more visible leadership to back the change. If this effort is to be successful it is essential to gain support, which will only be achieved by virtue of involvement and persuasion by a team of influential individuals (i.e. a management team and a chairman). This team, also to include representatives from throughout the organisation, should then collaboratively implement the new system by taking into account the needs of each department in addition to those of the organisation. Task 1 and Task 2 will give you practice with the analysis section of a Case Study. Tasks 3, 4, 5, 6 and 7 will give you some examples of recommendations. Look at the following diagram and listen to the text. Use the information given to fill in the blanks. You can pause the text if you need time to write, and listen more than once if necessary. Lewin's (1951) Force Field Analysis can help us understand how companies handle resistance to change. Lewin's model distinguishes between 'driving forces' (forces for change) and 'restraining forces' (forces against change). Listen to the text and group the examples given according to whether they are driving forces or restraining forces'. This is part of the recommendation section of a Case Study report. Try to put the sentences in the correct order, then listen to check. This is part of the recommendation section of a Case Study report. Decide whether the examples given are advantages (+) or disadvantages (–) of a product-based organisational structure. Listen to the way recommendations are made in the text and fill in the gaps. You can pause the text if you need time to write, and listen more than once if necessary. Listen to the way recommendations are made in the text and fill in the gaps with the phrases given. You can pause the text if you need to, and listen more than once if necessary.